2003 was a strange time for SEGA fans. It was the first year following the Dreamcast’s discontinuation with no new games released, new SEGA titles began to release on rival consoles, and a shocking conspiracy unfolded behind the doors of SEGA of America and Visual Concepts. In March, 2003, SEGA and Visual Concepts began beta testing NFL 2k4 – which later was released as ESPN NFL Football. In an effort to fine tune the game, a couple dozen gamers were assembled at an office park in Winter Park, Florida with the promise of trying out an exciting new product. Each gamer present, now given the role of video game beta tester, were given code names: Beta-1, Beta-2, Beta-3, etc. Each beta tester was paired with another tester, and the pairs were tasked with testing various modes and features. One innovative feature which SEGA was keep to promote was the game’s “crash-cam”, a mode which allowed players to experience the game in a first person perspective complete with a simulated on-screen helmet. The privilege of testing this mode fell on the pair of Beta-7 and Beta-8, with Beta-7 being the first to try it out. At first, everything was normal for Beta-7. The new mode was described by him as “SICK” and “awesome”, everything was going great… until he blacked out. It was this first blackout that lead to Beta-7 creating his own blog, in an attempt to find out the truth behind this and many future blackouts experienced. As the blackouts continued, Beta-7 discovered bruising on his body and would wake up in places that were different from where he remembered being before. Was SEGA’s “crash-cam” to blame? As weeks passed, Beta-7 learned that other beta testers had experienced similar blackouts. 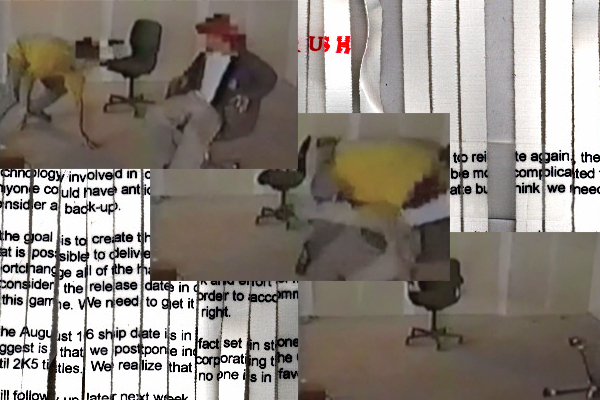 Through security footage and an inside source, known only as “Beta-X”, it was discovered that during these blackouts individuals would violently tackle those nearby. Beta-7 and others questioned the developers, and Beta-7’s friends even went so far as to scavenge through Visual Concepts company trash in an effort to find documentation. 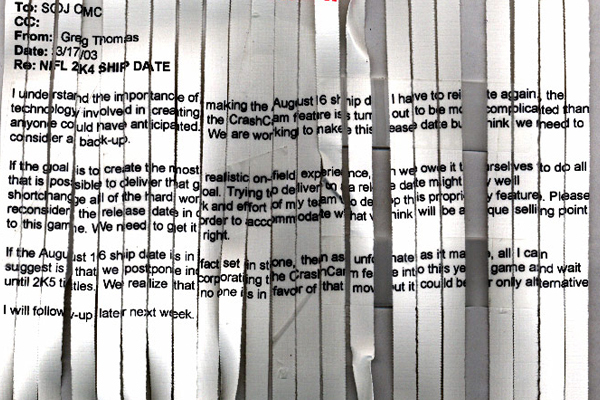 Amazingly, through pieced together shredded e-mails it was discovered that there were internal discussions at Visual Concepts regarding the “crash-cam” feature. There were concerns that the feature was “more complicated than anyone could have anticipated” and that the game would have to remove the feature, risking a delay of the game. Things came to a head when Beta-X contacted Beta-7 with an unaired ad which featured a title card promising that video game playing does not lead to “violent or erratic behavior”. SEGA and Visual Concepts knew something was wrong with the “crash-cam” feature, and according to Beta-X something big was going down in San Francisco that Beta-7 had to be there to see. Beta-7’s final blog entry was an update stating that he was getting ready to fly out to San Francisco to meet with Beta-13, another blackout sufferer, and the mysterious Beta-X. Beta-7 was not heard from again, and subsequent blog entries, written by Beta-7’s friend Rob, revealed that Beta-7 had never contacted his friend upon arriving in San Francisco. 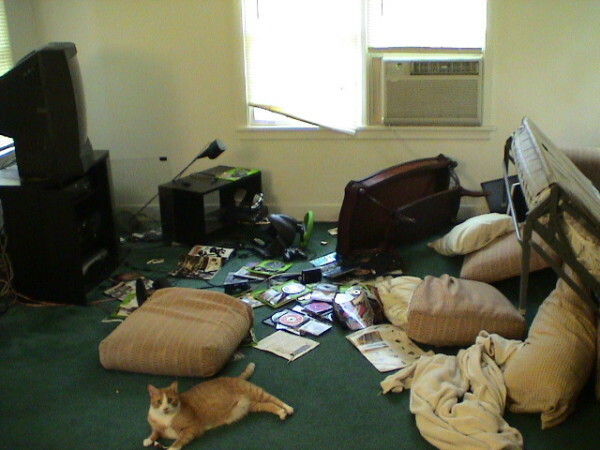 Beta-7’s apartment had been ransacked, with his CPU, game consoles, and file folders stolen. Had Beta-7 done this to throw others off his trail? Or perhaps, SEGA knew Beta-7 was onto them and got to him before the flight to San Francisco could ever take place. Whatever the answer, the strange case of Beta-7 is an unreal tale from SEGA’s past. An unreal tale because… it wasn’t real at all. The Beta-7 story was an elaborate marketing campaign dreamed up by the New York advertising firm Wieden + Kennedy and The Blair Witch Project filmmakers Chelsea Pictures directing group Haxan. Through fake forum posts leading up to the Beta-7 blog, the marketing team created a video game fan who turned from a beta testing hopeful to an unfortunate lab rat experiencing mysterious side effects. Websites, security camera videos, voicemails, e-mails, classified ads and many more elements were created to tell the story, with blog posts appearing in real-time. At the time, several websites and gamers fell for the story, with the fake websites created by Wieden + Kennedy accumulating more than 2 million hits. SEGA’s sales of the game reportedly exceeded projections by 20%, despite real-life delays which were not caused by the Beta-7 incident. The campaign won several awards, including a Grand CLIO award, a gold Pencil at The One Show Interactive, and a “Big Idea chair” at the Andys. Whether or not you remember the Beta-7 campaign, it is truly one of SEGA’s craziest and most elaborate attempts at promoting a game, and proof that SEGA still had inventive tricks up their sleeves after the demise of the Dreamcast. Following the campaign, Wieden + Kennedy dropped SEGA as a client due to what they described as “conflicts”. It is unknown what these conflicts were, but if you ask me I think there may have been a bit of truth to the Beta-7 story. We’ve also uploaded a case study video from Wieden + Kennedy, which can be viewed on our YouTube channel. What are your thoughts on the Beta-7 campaign? Sound off in the comments section below.